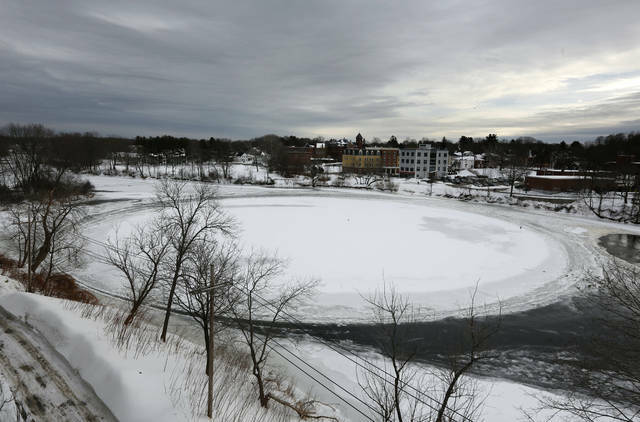 A naturally occurring ice disk that gained international fame appears to be freezing in place following a stretch of frigid weather, Wednesday, Jan. 23, 2019, in Westbrook, Maine. The giant ice disk on the Presumpscot River now has its own webcam. WESTBROOK, Maine (AP) — A giant disk of river ice has proved too much for a New Jersey attention-seeker who tried to carve a peace sign on it. Christopher Angelo, of Lavallette, New Jersey, went onto the ice, Thursday, Jan. 24, with a hatchet, saying he wanted to transform the natural phenomenon into a spinning work of art. But he was unable to get the disk spinning — and his peace sign came up short, too. The massive disk appeared last week in the Presumpscot River in Westbrook, Maine, mesmerizing onlookers as it spun slowly before coming to a stop, Tuesday. Stories, photos and videos have been shared widely. Police declined to intervene Thursday, saying it wasn’t a crime to hack at river ice. The Portland Press Herald reports Angelo has a history of staging public stunts. https://www.sidneydailynews.com/wp-content/uploads/sites/47/2019/01/web1_122200124-097b66234c4447dfb800ea924aa7580e.jpgA naturally occurring ice disk that gained international fame appears to be freezing in place following a stretch of frigid weather, Wednesday, Jan. 23, 2019, in Westbrook, Maine. The giant ice disk on the Presumpscot River now has its own webcam.